Crimson Crater is the sixth and final level in the Heroes story of Sonic Riders: Zero Gravity. Set upon a vast signal tower for MeteorTech that Robotnik has built atop an impact crater in the middle of the desert, the structure's glassy struts and surfaces provide opportunity for some particularly gravity-warping Extreme Gear sports. Many times in this race, riders will be travelling vertically up the tower's structure, and there's brutal hairpin bends on the horizontal sections which mandate gravity drive turning over bottomless pits. There are a number of higher-level shortcut routes if you can trick off ramps with high enough skill. The mural in the ruins refers to "divine wings", but why does the stone monument have the name "Babylon" inscribed upon it? The Babylon Rogues' looting means Team Sonic's trip to Gigan Rocks wasn't as fruitful as expected, but Knuckles' knack for dead languages points them in the direction of Crimson Crater - known to the Babylonians as "the Great Scar" - for their next port of call. Racing across the desert on their hoverboards, the heroes run into their avian counterparts at the rim of the crater. It is no longer an arid meteoric dustbowl, as Eggman has constructed MeteorTech's global signals tower and Mother Computer right on top of the spot where the first Ark of the Cosmos crashed. As if stopping the fat scientist's robotic takeover of Monopole weren't exciting enough, Jet proposes two additional piece of incentivisation to Sonic: whoever wins gets all the Arks of the Cosmos and the title of "Fastest creature in the universe". The blue hedgehog is more than happy to take him up on the offer. 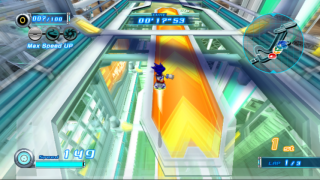 In the cutscene after the level, the racers bust into the Mother Computer room at the top of the tower just as Eggman is about to insert the extra two Arks and regain control of his SCR-GPs. The good Doctor wails as his Eggmanland plans are laid waste once again, while Sonic, despite winning the race, hands the five Arks to Jet, as he at least has some ancestral claim on the Babylonian treasure. A rumbling in the ground signals the arrival of Babylon Garden, drawn into the vicinity (according to Wave) by the resonance of the five Arks together. A conspicuous omission in this level is Amy Rose, who, despite being with Sonic, Tails, and Knuckles in the opening cutscene, has vanished during the race and the post-level cutscene. Two moons are visible in the sky above Crimson Crater during the level, possibly providing some clue to the whole Sonic Adventure 2 fractured moon controversy.